What’s your name on Ravelry? 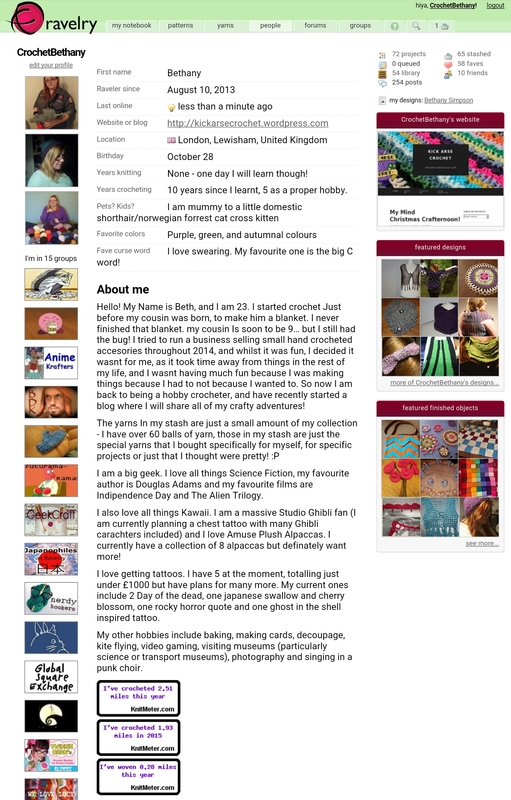 If you don’t have a Ravelry account, why? I do indeed. My name is CrochetBethany. As you can see, I have 72 projects listed. I hope to reach 80 by the end of the year. You can also see I use knit meter. My aim is to reach 4 miles by the end of the year. And with that, the 30 Days of Crochet Challenge is over. 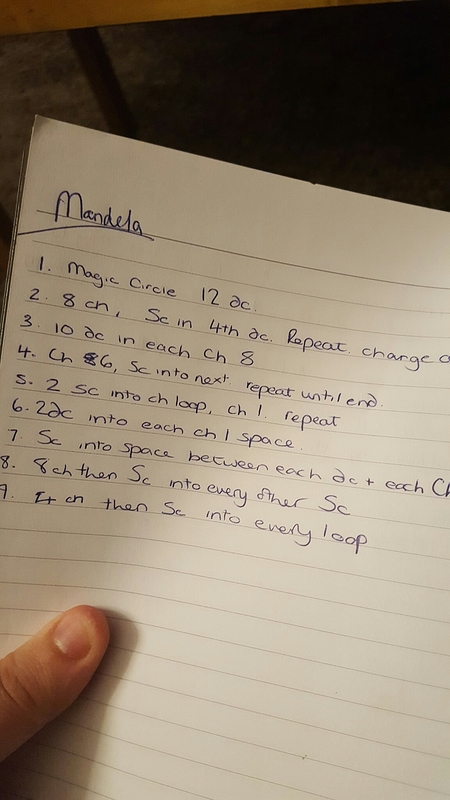 If you want to take the challenge – I found this challenge on Knitting in Wonderland via Missy’s Crafty Mess. Do you have any tips, or things that you’ve learned from crochet? I guess the most important thing I have learnt, the best tip I can give, is to love what you do. However ugly it is, love what you do. You made it. You put your love into it. So love it. Also, remember that you see what you work on much more than anyone else. You may see little imperfections everywhere, which is natural when you work so closely with something, but the recipient will just see the love and care that you put in. So try not to be too hard on yourself. Do you do any other crafts besides crochet? What are they, and did learning to crochet come before or after learning these other crafts? Again, if you have been reading for a while you will be aware that I do many other crafts. 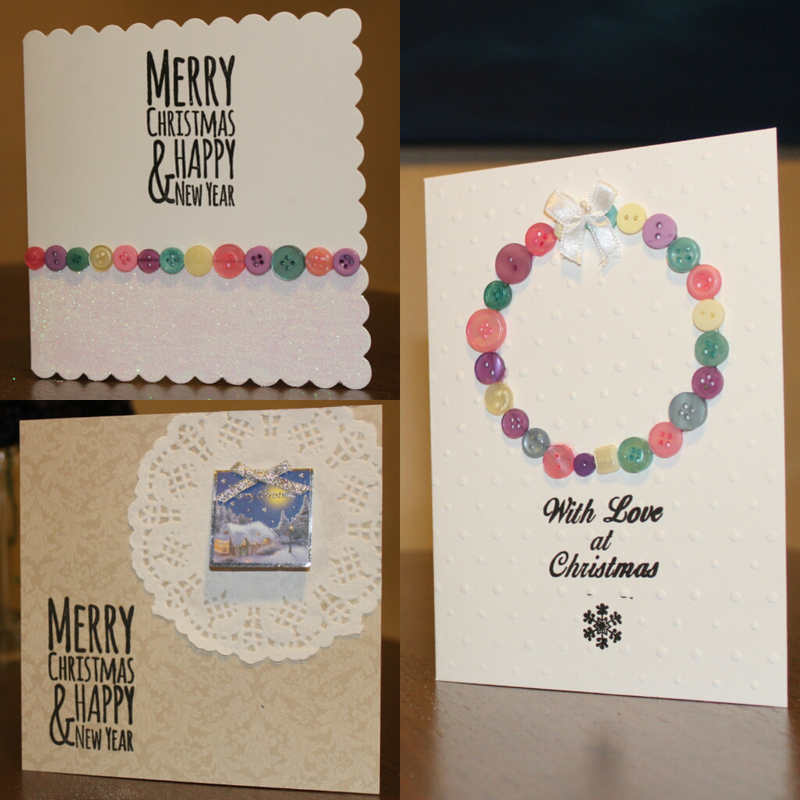 But for people who may have discovered me through the 30 Day Challenge, my 2 main other crafts are card making and baking. But I also occasionally weave, sew, decoupage, dye yarn, and I have also tried embroidery and felting but I didn’t take to them as well! Crocheting was, however, the first craft I learnt. How do you acquire most of yarn? Online retailers, local yarn shops, swaps, or large chain craft stores? What’s your favorite? I usually buy most of my yarn in sales. Wether that’s online or in store I usually seek out sales. If I need something specific, I usually head to John Lewis on Oxford Street. They have a pretty good craft section. Of course, if I see an independent yarn shop, I always pop in and grab something. 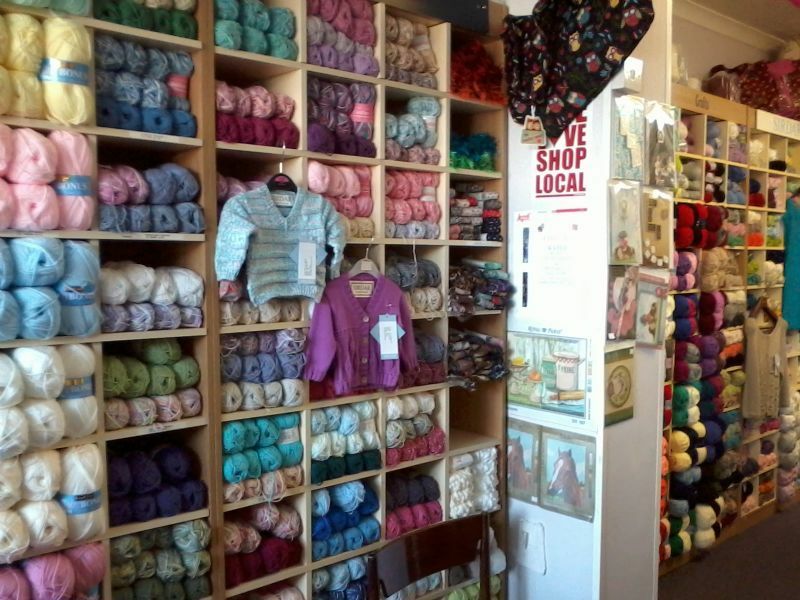 There’s a yarn shop called Hours in my parents home town and it is run by some very sweet ladies. They have a loyalty card too, which I get another stamp on whenever I visit my folks! Have you ever been a part, or wanted to be a part of a crochet-a-long? What was it? If not, why? As most you will already know, I just bought the first load of yarn for my first ever CAL just weeks ago. It’s for the exclusive CAL in simply crochet magazine! 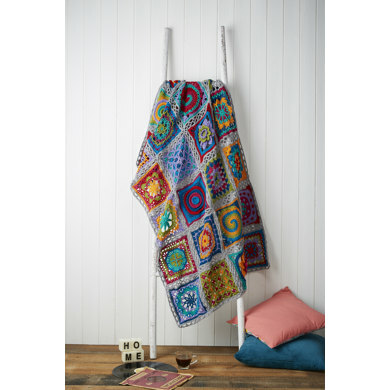 Do you have a crochet book or a place where you keep patterns, ideas, size measurements? Post a picture of it! I don’t have a specific notebook just for crocheting, but I do have a notebook where I put all of my notes, wether that’s ideas, patterns, recipes, thoughts, goals or just shopping lists and to do lists. 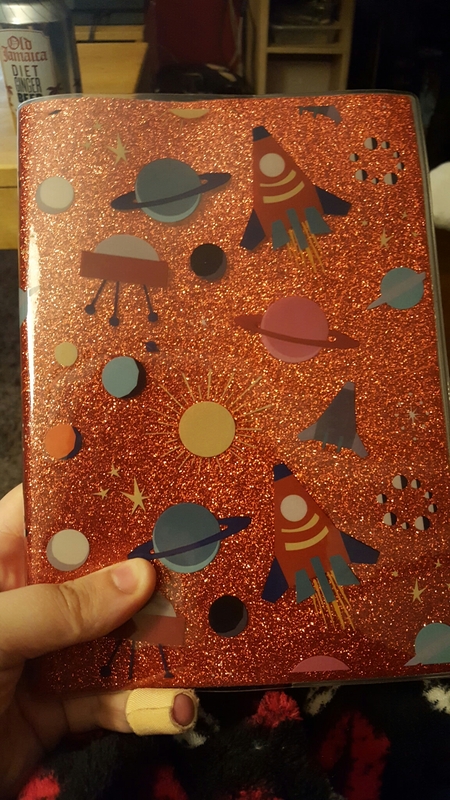 I love this notebook because it’s glittery and covered in space things! It’s quite scruffy, but as long as I know what’s going on that’s all that matters right? 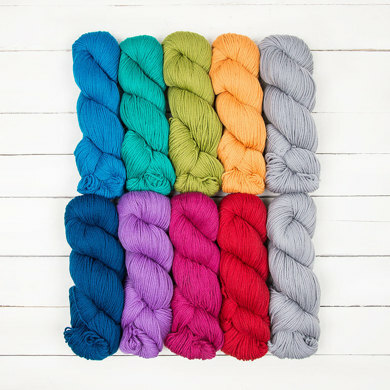 Have you ever made your own pattern or dyed your own yarn? 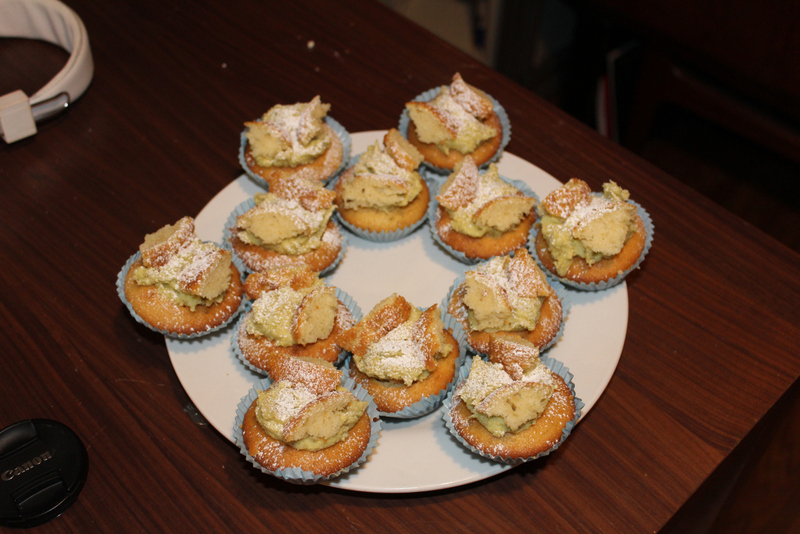 How did it turn out? On the left is my Spring Green Infinity Scarf, On the top right is my Candy Sweet Bow, and on the bottom right is my Rustic Cowl. I have also dyed my own yarn. Only once mind. I would love to try again. You can find out about it here.